Many of our customers come in with a strong desire to match their newly-updated kitchen to the rest of their home. While installing the same flooring throughout your home can be incredibly expensive and attempting to matchup appliances is all but impossible, they can find a way to fulfill this desire in their backsplash tile. There are a few particular ways to synchronize your kitchen’s backsplash tile with other design elements in your home; we’ve decided to break this distinction in half with direct and indirect matching. If you’re a little confused, read on! The most blatant way to directly match your kitchen backsplash tile elsewhere in your home is to re-use it, tile for tile, in another spot. Perhaps you could place this tile above the mantle of your fireplace, within the soapdish of your showers, or even on an entire wall in a utility room, like a bathroom or laundry room. 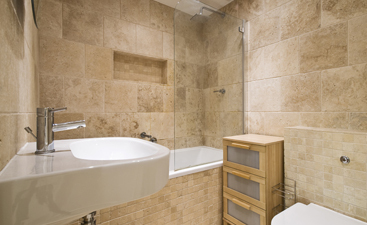 Obviously, the easiest way to achieve this look is to first already have planned on using tiles in both areas, then purchasing and installing those tiles at around the same time; alternatively, and more difficulty, you can attempt to directly match existing tiles after-the-fact. 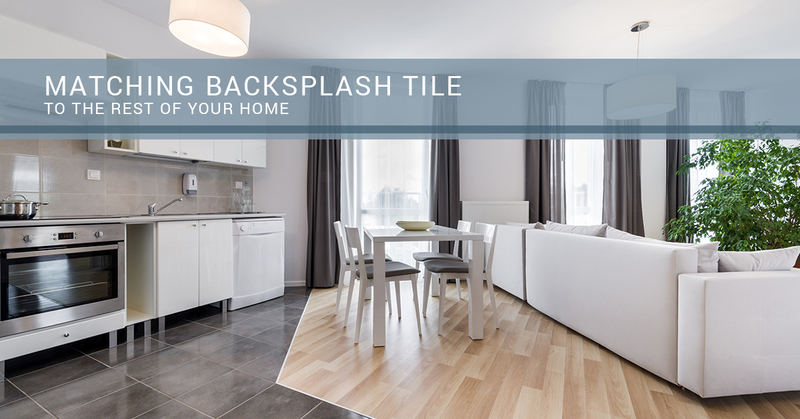 In most cases, homeowners either can’t or don’t wish to use their backsplash tile in other rooms, but they still desire a matching look. In these instances, we advise homeowners directly match their backsplash or wall tiles to the other in one or more ways, without using the exact tile. For instance, you can use a large white subway tile in the bathroom, while using the smaller version for your backsplash; this provides your home with the same look, but allows for a clear distinction as well. Likewise, homeowners can simply match the color, texture, size, or other features to those found on tiles elsewhere in the home. If you update your home to a clean-line, contemporary look, but still have a floral-print wallpapered bathroom, then clearly the feel of your tile backsplash and (lack of) bathroom tiles are going to be out of synch. Likewise, plenty of tiled bathrooms do not match with an updated kitchen in a way that makes the entire home feel like one coherent design. Indirectly matching these tiles can be done without directly aligning color, shape, or texture, but instead focusing on the overall feeling that the tiles and rooms embody. This can be as broad as matching the light and bright feelings of your new kitchen to as narrow as thin, bar-like tiles that embody contemporary design with a rustic feel – it’s all about how you choose to match these impressions! 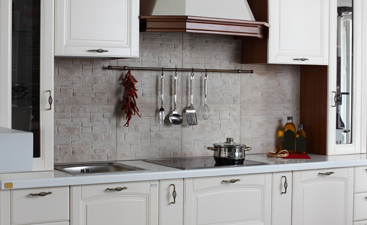 Another great way to indirectly match your kitchen backsplash tile is to use design elements other than tiles. For instance, when looking at throw pillows for your living room’s couches, you could consider matching the colors and patterns with those found on your kitchen backsplash. 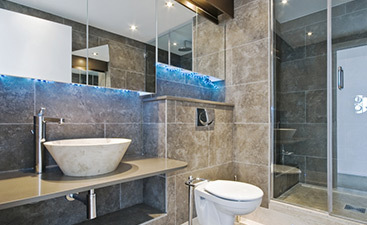 The same can also be said for entire rooms, where flooring, tile, furniture, and other elements can be made complementary to your kitchen’s design; even if the rooms cannot be seen at the same time, someone touring your home for the first time will get the sense that you designed it to feel connected.